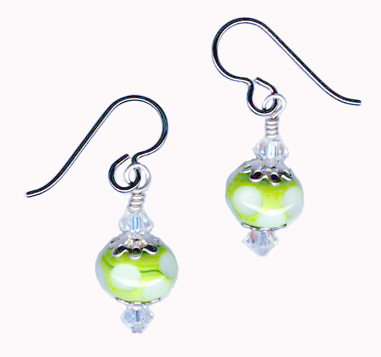 We are pleased to offer earrings showcasing the Lampwork glass bead artwork by Candy Wall. These gorgeous handcrafted beads are unique and one of a kind. Truly a keepsake. Lovely handcrafted glass lampwork beads in light green with white circle pattern, offset with sterling silver and Swarovski crystal accents and suspended from titanium earwires. 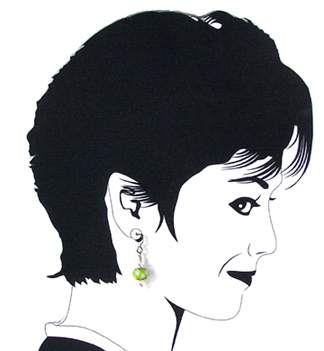 Earrings measure approximately 7/8 inch in length Made with titanium french hook style earwires, our earrings are suitable for metal sensitive ears.